As we move into the second week of January, looking back over the outcomes from 2017 offers insight into what to expect for 2018 and an indication of how to allocate capital within investment portfolios. A vital component to successful fund management is effective risk management – as investors worldwide seek optimal risk-adjusted returns. Liquidity has been one of the biggest risk factors for investors of all sizes and structures, particularly since the GFC. One of the key themes of 2017 was expanded capacity in market liquidity. 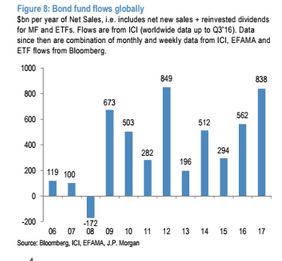 According to end-of- year research from JP Morgan, global liquidity will continue a trend of growth from 2017 and throughout 2018. Specifically, when looking at global money supply vs. a medium-term money demand target, the data indicates that global liquidity has been steadily increasing over the past 5 years, reaching peak levels in 2017. Based on the assumption of enhanced global economic policy stability in 2018 we can expect this measure to reach even higher highs this year. Aside from liquidity, arguably the biggest challenge for fund managers is volatility. 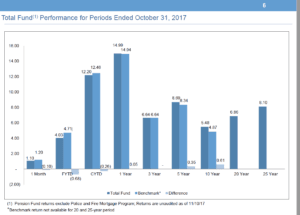 Taking a look at hedge fund and mutual fund beta performance over the course of 2017 provides an indication of how much risk these funds are taking on and a signal of risk appetite within the current market climate. The data from JP Morgan demonstrates that a rolling 21-day equity beta of US balanced mutual funds versus the S&P 500 and Barcap US Agg Index drifted considerably lower over the past year – from approximately 0.7 in January 2017 to close to under 0.55 by year end. This indicates a conservative approach – where capital preservation may be increasing as a priority. Looking at Equity L/S, the rolling 21-day equity beta against the S&P500 indicates a fairly stable risk appetite - when looking at this metric, levels consistently swing between 0.3 and 0.6 within each year since January 2015. Similarly, when considering currency hedge fund USD exposure, the rolling 21-day beta to the JPM USD tradable Index has been moving sideways around 0.5 over the past 3 years. Contrary to the other segments, the equity beta of CTAs has been drifting higher over the past two years – reaching levels as high as 1.3 in 2017 when calculated against the daily returns of the SG CTA Index, indicating significantly increased risk appetite in this investment space. MiFiD II – Impact on Trading Volumes? In preparation for adapting to MiFID II regulations we saw some reduction in trading turnover in 2017. However, there has not been any substantial impact on trading volumes from the new regulation, yet – with its launch into operation only days ago on January 3rd, 2018. Looking at fixed income impact, the JPM data shows that trading volumes for government bond futures this January have remained consistent with year on year levels of the past 3 years. Similarly, for equities, when looking at monthly trading volumes over the past year for European exchanges we observe that equity markets are also experiencing little impact on trading volumes from MiFID II, so far. Although the impact appears insignificant right now, we are only days into the implementation of the regulation. It is only after observation over a longer window of market activity will we ascertain a more accurate estimate of impact to markets of this far reaching regulation. Overall, 2017 was a strong year of performance for markets. 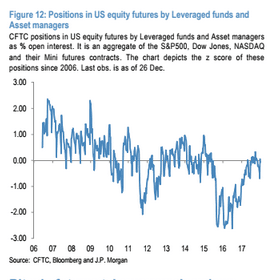 Although certain market characteristics indicate the opportunity for taking on increased risk with investments in 2018, overall sentiment and positioning appears to be remaining on the side of conservatism and caution as we kick off the new year. 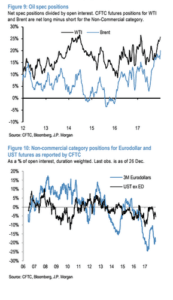 *JPM - Flows & Liquidity, 2018 flow themes, 5th January 2018.